The Many Mini-Adventures of the Wards: Fiber what? 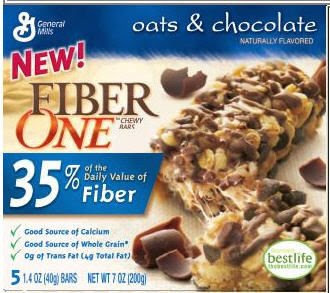 So Jeremy's sister, Kari, has been talkin' up these awesome granola bar things called FIBER ONE BARS. They are only 140 calories each and they taste like a candy bar! And they have 9 grams of fiber in each bar. Whew! The Christopherson kids lovingly call them Fiber Fart Bars. Classy. I put one in Trevor's lunch yesterday and when he came home from school he said, "Mom, I like those Fiber One bars, but please don't put them in my lunch anymore." The look on his face implied that I should know why he wouldn't want to consume one of these bars at school. He got that embarassed grin on his face and turned away from me. Um. Yeah, I got it. He doesn't want any embarassing noises flying from his general direction while he's at school. Mom is clued in! Then this afternoon he downed 2 of those bad boys. 2 hours later he was pretty proud of the noise machine he had knowingly created. Dinner at the Ward house was definitely an experience to remember. Or not. So, if you have not tried this delicious, tasty, fiber-filled, fart-producing treat then you need to go out and get yo'self some. I don't know if it is just the late hour at which I am reading this, but that post had me rolling! Ha! Is there any kind of disclaimer on the box? It sounds like there should be. My children would never make up a nickname like that! I'm offended. They are good, though.